A perfect choice for you who wants to add some protection to your ipad mini and use the keyboard on the go at the same time by adding only 7.7mm to the ipad mini. It combines both stylish look and great functionality. It can use as a stand, a cover, and a keyboard. Makes you stand out from everybody else.
. X scissors foot structure, the key is sensitive, typing response fast.
. 64 key design, provide you a more comfortable type experience. 【TACTILE TYPING EXPERIENCE】High quality X Scissor structure key cap and fast response time for maximum typing comfort and accuracy. Recommended for editors, Write down your stories or ideas any time any where you want as long as you own one Raydem keyboard, the slim and reliable typing partner. 【MAGNETIC COVER】 The iPad Mini Keyboard is secure by magnet when you close it for convenience and it will also turn your ipad into sleep mode at the same time. 【CLIP MECHANISM】The rubber padded clips fit perfectly with the overall shape of the ipad and providing easy access to all the functional ports and buttons. Easy to remove when needed. 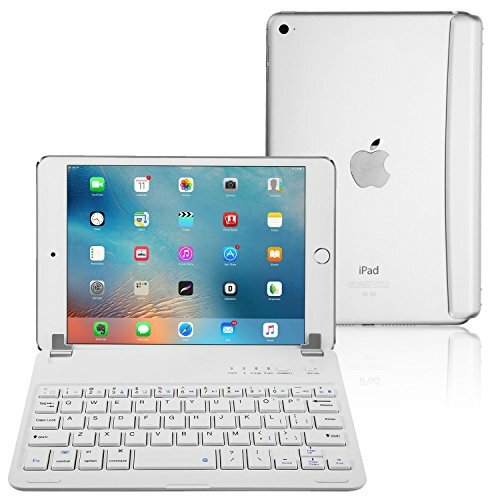 【INCREDIBLE BATTERY LIFE】Built-in 280mAh rechargeable Li-polymer battery ensures that the iPad Mini 3 / 2 / 1 Keyboard will work for more than 3 months (based on 2 hours use a day). Power-saving triggered after 10 minutes idle. If you have any questions about this product by Raydem, contact us by completing and submitting the form below. If you are looking for a specif part number, please include it with your message.